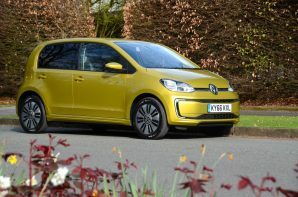 Home > The Most Economical Cars on Sale in 2019 in the UK for 10 Different Categories > Green Car Guides > City Cars > Volkswagen e-up! The e-up! is the first all-electric VW in the UK. Although the up! first appeared with conventional engines, it was designed to be electric from the start. This means that the battery fits in the floor within the wheelbase benefiting weight distribution, and retaining all of the interior and boot space. Before we get into the technical bits, the most important thing to know is that unlike your Christmas presents the e-up! comes with the batteries included. The downside of this is that the purchase price is noticeably higher. The benefits are no monthly battery lease costs, and both insuring it and selling it on when the time comes will be simpler than electric cars that have separate battery lease arrangements. In order to justify the elevated price tag, you can only get an e-up! with 5 doors and the specification includes everything you could expect on a city car including heated front seats, a heated windscreen, a removable Garmin navigation and information system which includes electric range calculators and a ‘Think Blue’ trainer that gives you real time tips, and electronic climate control. The comprehensive specification extends to the electric kit which includes rapid DC charge capability (CCS) which is often an expensive option. The battery itself is a 18.7 kWh lithium-ion pack which feeds an 81 bhp motor producing a very healthy 155 lb.ft of instantaneous torque. This results in good performance particularly in the urban environment. One of the best features is the ability to choose the level of regenerative braking using what would have been a gear lever. D provides no regen allowing coasting, D1 provides a little whilst 2, 3 and B provide increasing levels which are sufficient to activate the brake lights. This is great as whilst lots of regen extends the range, it can make it difficult to make smooth progress, so giving the driver the option is a welcome addition. The e-up! is a cleverly designed and thoroughly engineered city car which retains all of the practicality of the standard model. Thanks to the decision to include the batteries it is expensive, but this does simplify electric ownership, and the high specification including CCS rapid charge capability softens the blow a little. Recharge time: 240v charge 9 hours, 3.6 kW home wallbox (free option) 6 hours, DC CCS 40 kW rapid charge 30 minutes from 0 – 80%.